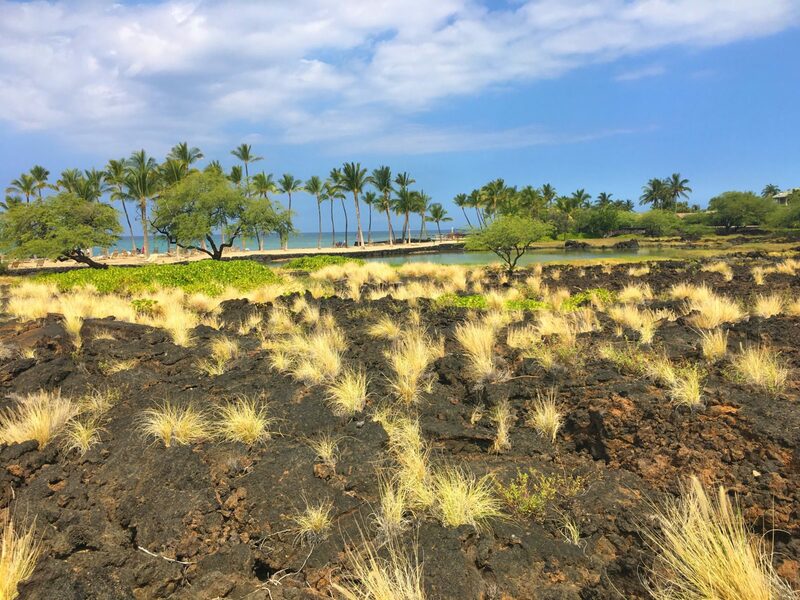 When I set foot in the Waikoloa Beach Marriott® Resort & Spa, I stopped in my tracks. That’s because the first thing I saw — straight ahead of me across the open-air lobby — was the brilliant blue ocean meeting the horizon, segmented by palms swaying in the breeze. It’s a scene that whispered in my ear, “Welcome to Hawaii… now it’s time to relax.” As if the resort’s only purpose was to coax me into letting go of my worries. 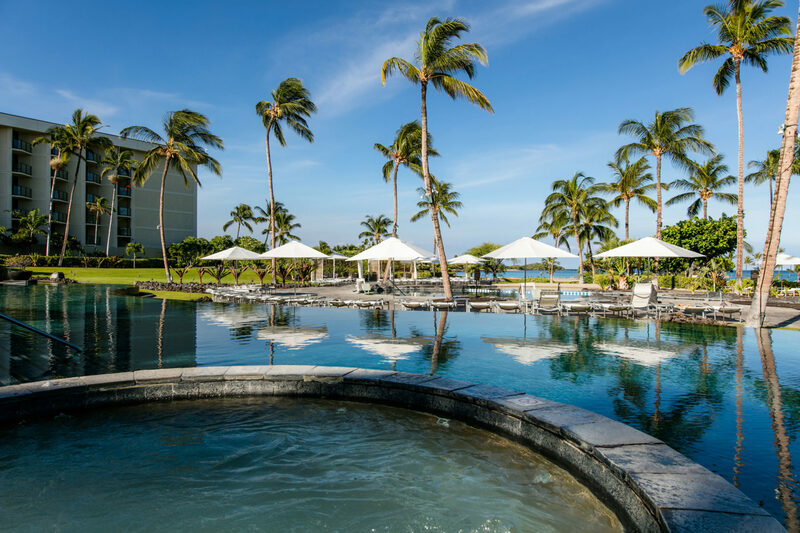 A section of this sublime property has been transformed into the newest Marriott Vacation Club® location, Marriott’s Waikoloa Ocean Club, which shares many of the amenities of the Waikoloa Beach Marriott Resort & Spa — including a spa, on-site dining, several pools, beach access and more. The setting is so beautiful, I wouldn’t blame anyone for deciding to spend their entire stay plopped in a poolside lounger. But the resort has so much to offer, I spent an entire day exploring — all in the name of helping you decide whether it’s a place you’d want to spend a day…or a week…or maybe two. Start the day with a buffet. With a full day of fun ahead, why skimp on breakfast? The on-site restaurant offers a buffet that’s pretty standard, although it does feature a few Hawaiian specialties. 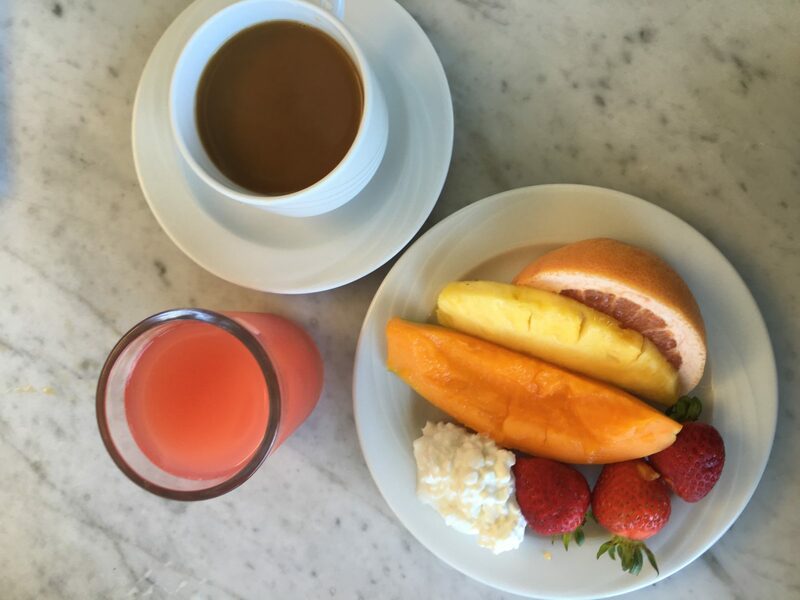 When I travel, I prefer to try local fare, so I filled my plate with island-inspired food featuring ingredients like macadamia nuts, guava, papaya and pineapple. If you’d rather grab your grub (and caffeine) to go, there’s also a walk-up coffee shop. Now that I’d loaded up on carbs, it was time to take a stroll down the boardwalk to the beach. And what a beautiful stroll it is! The path took me through lava rock, anchialine ponds and green moss, which really added a sense of place and authenticity to the resort. Once I reached the white sand beach, there was plenty of space to park a chair or towel and soak up the sun. I was looking for something a bit more active, so I decided to try a few water sports in Anaeho‘omalu Bay. After trying (and failing) to stand up on a paddleboard, I decided to hop on one of those hydro-bikes that looks like a bicycle strapped to two flotation devices. While it took a few minutes for me to get used to steering it, the bike was a fun way to traverse the waves — especially when I let the waves do most of the work and barely had to pedal. I was on vacation, after all. 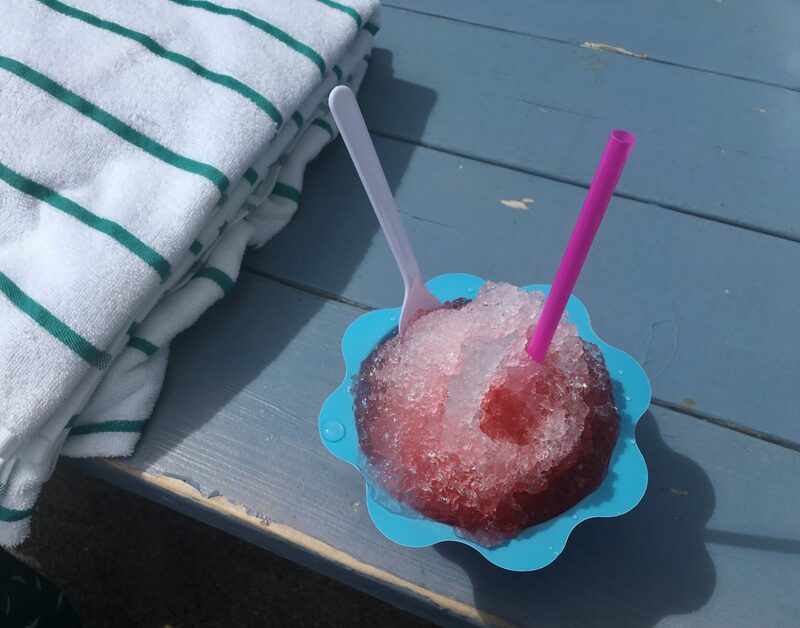 Later, I took a break from all that exercise to treat myself to a shave ice from the small stand next to the rentals vendor. Here you can combine up to three flavors in a massive cone that’s sure to give you an epic brain freeze. I enjoyed a guava, coconut and cherry combo that really hit the (sweet) spot after spending so much time in the sun. Can’t decide between kayaking, paddleboarding or snorkeling? 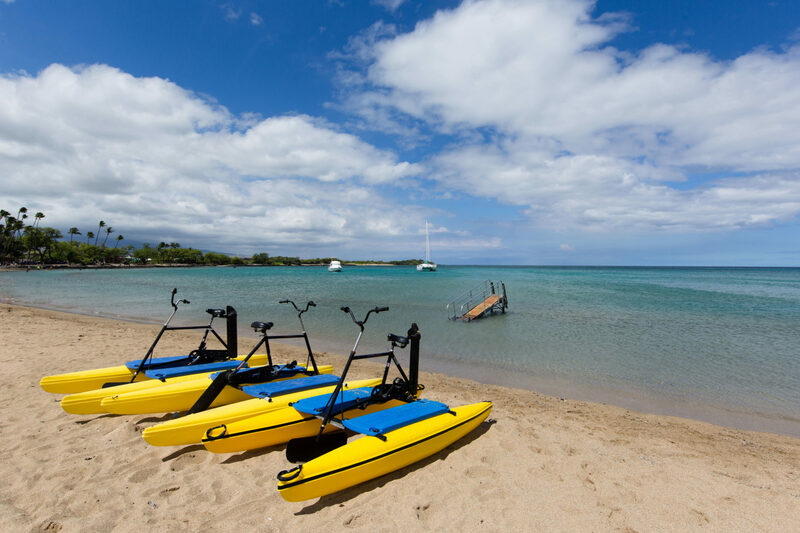 The water-sports vendor at the beach offers an “Aloha Days” special several times a week, with unlimited beach activity rentals for $35 per person, so it’s easy (and cost-effective) to experience ’em all. Now relax — it’s pool time. When early afternoon rolled around, I settled into a lounger poolside. A few guests were floating in inner tubes in the infinity pool and scooting down the waterslide, but I decided to order lunch instead. I opted for fish tacos and a few tasty frozen drinks with island flair. The Hawaiian margarita puts a tangy pineapple twist on the classic cocktail, but my favorite was the Lava Lava, made with Kahlua, bananas, grenadine and coconut cream. 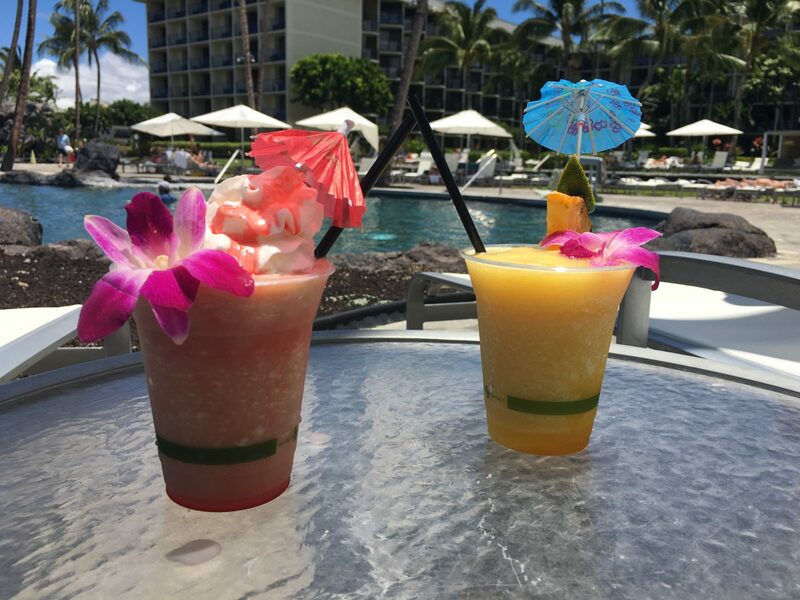 Keep in mind that food and cocktails at Hawaii resorts come with Hawaii-resort prices, so if you’re traveling in a large group or spending a long time on the island, you may want to consider buying food and drink in bulk at one of the grocery stores by the airport rather than purchasing everything poolside. That said, there’s something special about sipping a fancy tropical drink garnished with flowers and tiny umbrellas. If you decide to treat yourself to a poolside cocktail, I suggest choosing one you probably won’t find back home. Hit the shops…or the trail. In search of the ideal souvenir, I decided to check out the two open-air shopping plazas within walking distance from the resort (there’s also a complimentary shuttle). The Kings’ Shops are just across the street and include high-end stores such as Coach and Tiffany & Co., plus plenty of surf shops, restaurants and souvenir stops. But Queen’s MarketPlace down the road was my favorite, for two reasons: it’s home to a Starbucks and a food store called Island Gourmet Markets, where you can buy a limited selection of groceries or pre-made sushi, deli sandwiches and more. I ended up stopping at the latter shop many times during my stay for a quick dinner or to pick up a to-go lunch for a cross-island day trip. If you’re not into exploration of the retail variety, you can opt to take a wander down the beach. 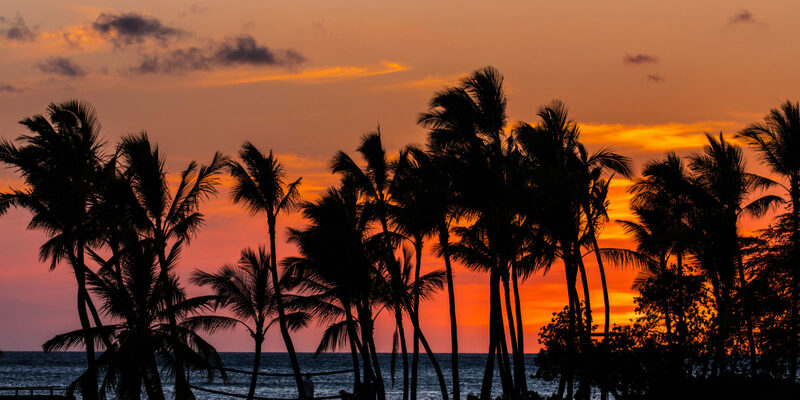 One of the coolest things about the resort is that it’s located along an ancient Hawaiian path, the 175-mile Ala Kahakai trail connecting historic villages and fishing areas along the island’s western coast. You can ask the resort concierge for details about where to access the trail and where to go to see ancient petroglyphs. Savor island food and culture. Twice a week, the resort hosts a luau on property featuring a traditional feast, Polynesian entertainment and more (reservations are required). In keeping with tradition, the festivities center around a kalua pig, which is roasted in a pit on-site. It’s unearthed at a ceremony during the event, then the meat is served along with a buffet of other native specialties. One of my favorite things about the luau was getting the chance to try several Hawaiian delicacies that I hadn’t yet encountered: poke (raw fish salad), lomi-lomi salmon (with tomatoes — think raw salmon salsa), and poi (purple, fermented taro root paste). Truthfully, raw fish usually makes me a bit squeamish, but I was impressed by how fresh and flavorful both the poke and salmon were. And while I’ve been told that poi can be an acquired taste —it turns from sweet to sour the longer it ferments — I enjoyed mixing it with rice. Drinks are included in admission, so you can enjoy your food with a side of libations if you’re so inclined. During the meal, a four-piece band provided a lively soundtrack of island-inspired music. Later, a troupe of energetic, talented and beautifully costumed dancers gave a variety of performances, from traditional hulas to folk stories that highlighted the rich history of Hawaii. The troupe also showcased dance styles from other countries, including New Zealand and the Cook Islands. One of my favorites was the Samoan fire dancer, who fearlessly twirled and tossed several flaming knives like they were harmless batons. 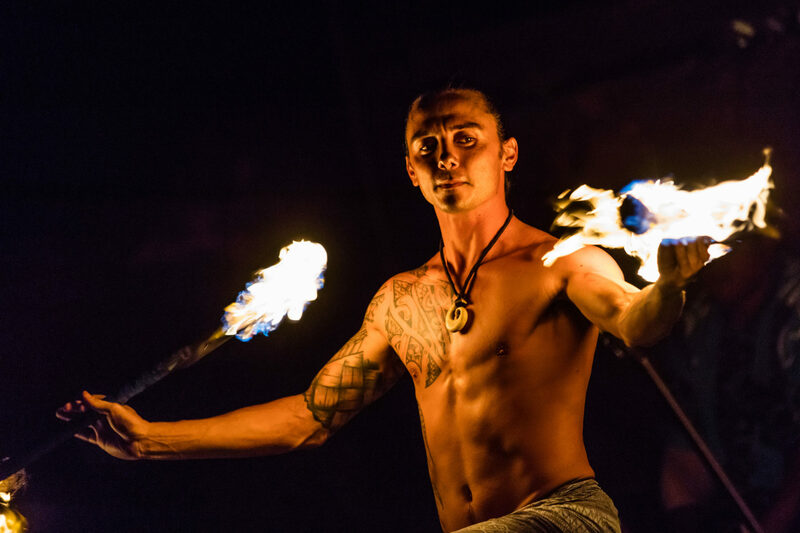 Overall, the luau was a fascinating glimpse into the interconnected cultures of Polynesia — and the perfect way to end a day in paradise.